A quality shower slider rail kit, the Euphoria has been designed and manufactured to the highest standards by Grohe. The installation of the 600mm shower rail is quick and hassle-free whilst the GROHE QuickFix system allows you to reuse existing drill holes or position them in the joints between tiles. Indulge in a relaxing shower with the two revitalising spray functions - Rain spray: A soft, delicate pattern to soothe the skin, mimicking warm summer rain or Smart Rain Spray: All the features and benefits of Rain spray but with a reduced flow. 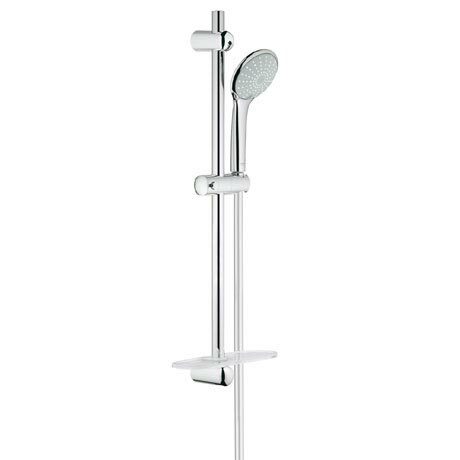 Overall a nice product we couldn't use the shower head though as the water didn't seem to come out powerful enough we are using a new triton electric shower unit so we brought a smaller head with less holes the actual riser bar and shower hose are of very good quality and look very nice.